Hardware technology doesn’t last forever. It has a lifecycle, a measurable beginning and end to its productivity and value. 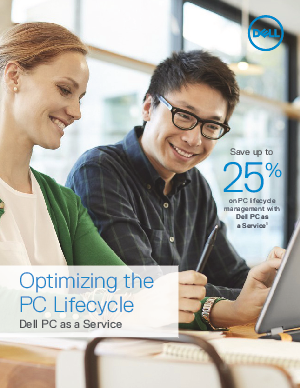 IT is tasked with optimizing the PC lifecycle while driving strategic breakthroughs for their organization. However, the high cost and complexity of PC management leaves IT little time for innovation. We offer flexible financing options that help assure IT will always have everything they need, when they need it, to keep end users engaged and productive. Learn more about Dell solutions powered by Intel®.